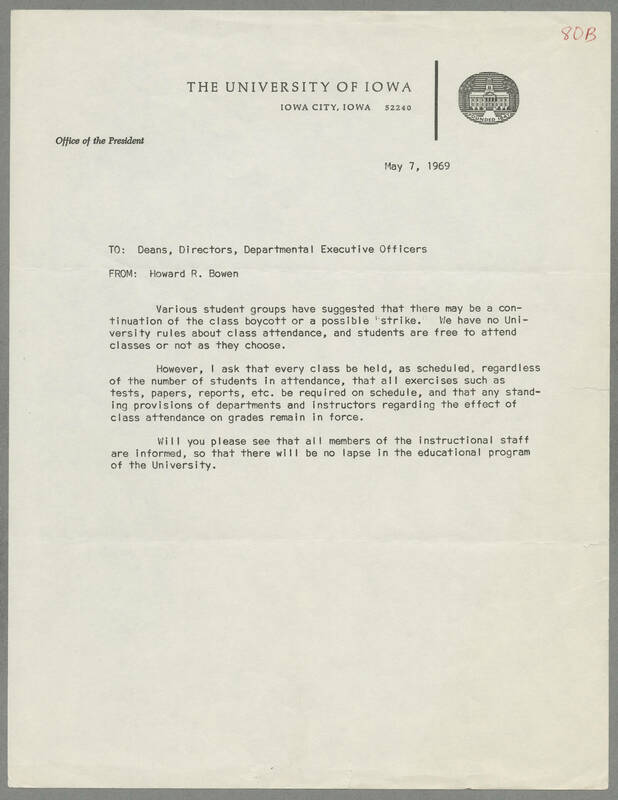 THE UNIVERSITY OF IOWA IOWA CITY, IOWA 52240 Office of the President May 7, 1969 TO: Deans, Directors, Departmental Executive Officers FROM: Howard R. Bowen Various student groups have suggested that there may be a continuation of the class boycott or a possible strike. We have no University rules about class attendance, and students are free to attend classes or not as they choose. However, I ask that every class be held, as scheduled, regardless of the number of students in attendance, that all exercises such as tests, papers, reports, etc. be required on schedule, and that any standing provisions of departments and instructors regarding the effect of class attendance on grades remain in force. Will you please see that all members of the instructional staff are informed, so that there will be no lapse in the educational program of the University.